A comparison. The mainstream media report on stories, detailing specific facts, and then ignore the skepticism that reading their stories would inspire! They don’t even follow up on facts they report. They ignore their own stories. Let that sink in as I provided this comparison. Let’s look at the crash site and debris field. 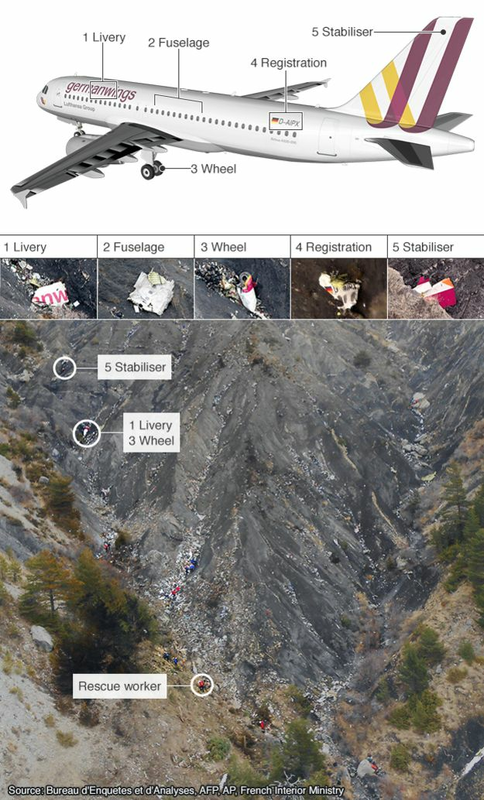 This is what was left of Germanwings FLT 9525, an Airbus A320. Notice the referenced graphic from BBC News. A significant debris field, to be sure. Reference, anyone? 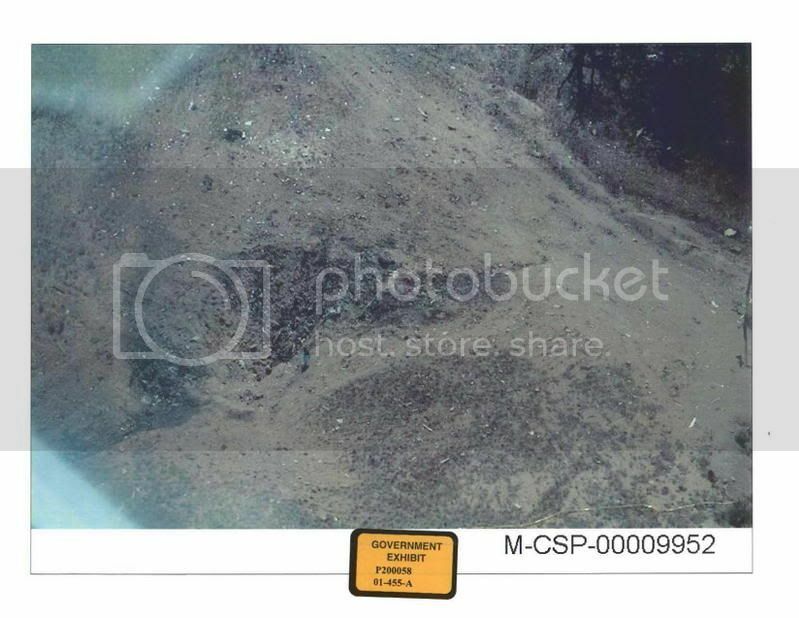 Compare it with the remains of FLT 93, a Boeing 757–222, at the edge of a strip-mining quarry in rural Pennsylvania, about two miles due north of Shanksville, PA, in Stony Creek township, on September 11, 2011. Quite a difference in appearance, I must admit. And I always had questions about that since we’re on the subject of airline crashes. Where are the 6-ton Rolls-Royce Engines and 60-ton high grade aluminum/titanium alloy frame? That must have been some collision to completely destroy and atomize and disintegrate every scrap and fragment of the plane almost at the molecular level. And what’s more interesting to me is how many self-styled aviation collision experts will make up answers on the spot. I’ve been assured by these luminaries and aviation crash authorities that at the right speed a plane will disintegrate upon impact. Well, some. And even though this defies any and all logic. And for the life of me, after careful review and a scrupulous command of the facts, I cannot recall any representative of the lucid media asking about this much less noticing the obvious inconsistencies. This isn’t a conspiracy theory. No accusations of inside jobs or cabals and corrupt covens. No criminal conclaves or consortia. This isn’t skepticism or a refutation of anything. This is just and merely a discussion of the patently obvious, the blatantly apparent. At least to you and me. Didn’t someone mention this? Yes. It was reported repeatedly but the gravamen of the story never stuck. CNN reported this and I reference it verbatim with emphasis added. Read this carefully. Meanwhile, investigators say they’ve found debris from the crash at least eight miles away from the crash site. State police and the FBI initially said they didn’t want to speculate whether the debris was from the crash, or if the plane could have broken up in midair. Investigators later said the debris was all very light material, such as paper and thin nylon the wind would easily blow. The wind was blowing towards Indian Lake and New Baltimore at 9 knots. “According to the NTSB, it is not only possible that the debris is from the crash, it is probable,” Crowley said. What?! Read that again. That must have been some wind. A mighty wind to reference Christopher Guest. Amazing, is it not, the differences in the crash sites? I’m sure there is a perfectly sound basis for the disparity in destruction. Magic. Engines askew. Significant scattering. Fascinating stuff one would think. In fact, it was reported in PittsburghLive.com on Friday, September 14, 2001, “before it magically disappeared” sometime after October 20th or so from a website with articles from much earlier dates still archived, the following. Interesting. Anyhoo. [State police Maj. Lyle] Szupinka said investigators also will be searching a pond behind the crash site looking for the other recorder and other debris. If necessary, divers may be brought in to assist search teams, or the pond may be drained, he said. Here we go again. And enter those pesky conspiracy theorists again. In 2002 The Independent reported that some “will say that the plane was shot down by a missile, perhaps a heat-seeking missile that honed in on one of the plane’s engines – a theory possibly substantiated by the 2,000yd flight of the 1,000lb engine part, but arguably refuted by consistent eye-witness accounts, including Lee Purbaugh’s, that when last sighted the plane was not emitting smoke.” How have the media missed that which they reported. How weren’t and aren’t curiosities piqued? So, what does all this mean, Alfie? It means that I find these stories fascinating, truly fascinating. As well as the media’s organic sense of incuriosity. I’m no aviation crash expert nor do I play one on TV, but I do know rudimentary laws of physics and that debris fields of plane crashes eight miles away likely don’t involve gusts and zephyrs causing engines to waft through the air. It’s evidence again of why I believe absolutely nothing in the ossified American mainstream media. Today’s podcast subjects. Glad you asked. Take note. The lack of interest on the part of the Jurassic mainstream media in the psychiatric treatment of Andreas Lubitz, specifically what psych meds (if any) he was on or coming off of. Read this wonderful disquisition on the subject from Paul Joseph Watson. But why should they be intrigued by this aspect of the case when they’ve missed so much about other cases? The difference in coverage if Andreas Lubitz had been Muhammad bin Whatever. The obvious discrepancy should be glaring. The remote control capabilities of today’s planes. This is most interesting, I believe. A comparison to FLT 93 near Shanksville as indicated supra. The horrid coverage in general of the incident. ← LIONEL PODCAST: Orwell Couldn’t Believe This!